The success of the project earned UTA the MTEC Prototype of the Year Acceleration Award (under $1 million) at the consortium’s fourth annual membership meeting in March. The award is given to the project that effectively advances a novel prototype technology to its next major milestone in a 12-month period. Mickey McCabe, executive director of UTARI, said the award builds UTA’s reputation among the federal research community as an effective, efficient institute for advancing research ideas to practical implementation while improving health and the human condition. 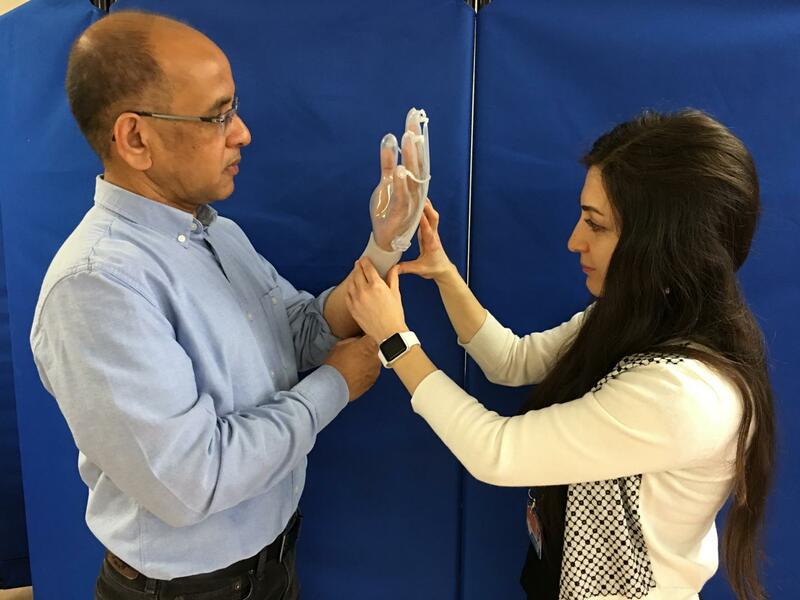 “Complex hand wounds can be debilitating, and current therapies often lead to excessive scar formation and fail to preserve range of motion,” said Lauren Palestrini, MTEC director of research programs. “I believe that the REHEAL Glove addresses many of these limitations and hope its utilization will improve treatment of these injuries. The team, led by Dr. Wijesundara, has done a great job developing a process for low volume production.